Our clients, a busy family with 4 young children, tapped Niche to transform their bland, dated Sonoma vacation home into a vibrant, eco-friendly retreat for their large group of friends to enjoy on the weekends. 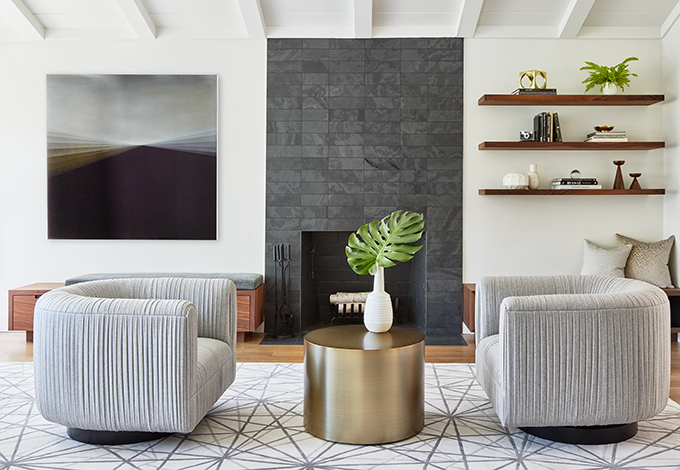 Their affinity for vibrant color and mid-century design informed the design of the home, from the kitchen backsplash to the colorful upholstery and rugs. Custom pieces by local artisans are found in every room – from the eco-friendly, non-toxic upholstery to the bespoke walnut and steel dining table. Paintings and photographs by local artists, such as Liz Maxwell and Markham Johnson, reinforce the indoor/outdoor connection. Sleeping capacity was maximized for frequent slumber parties in the girls’ bedroom, with a pair of bespoke twin over full bunk beds with trundles. A pool house was added to the property, with expansive decks capitalizing on the incredible forest views. We designed a wall of cubbies for stashing clothes and towels, with the client’s signature pop of orange as a backdrop. A band of white Fireclay tile adds graphic interest in the shower. The Niche team took full-service to the next level. Jennifer and her team managed the entire remodel, taking care of all the details and installations. We couldn't be happier!